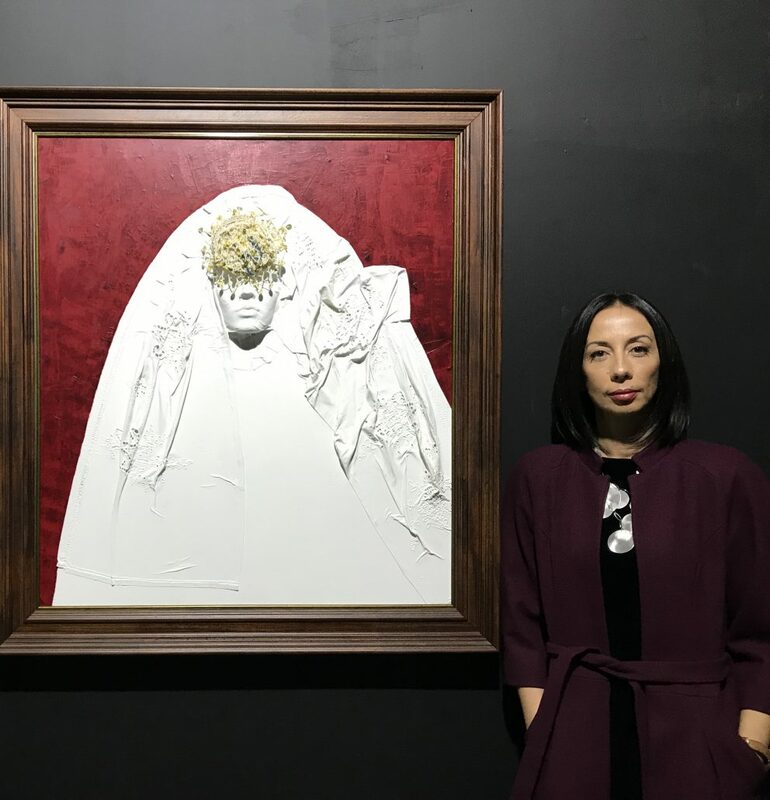 We sat down to speak to Artist Shqipe Kamberi in Pristina, Kosovo regarding her recent personal art exhibition titled “Consciousness: Past and Present” displayed at the National Museum of Kosovo. 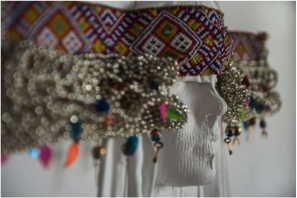 Shqipe began actively pursuing the arts upon graduating from the Academy of Arts at the University of Pristina in Kosovo in 1998. She showed dedication to her career through painting whilst also working as a TV set designer. Her recent work is particularly interesting as we are in the midst of 16 days of Activism against Gender-based Violence, where violence is also pervasive in silent forms, in ways that are not as easily visible to the public eye. 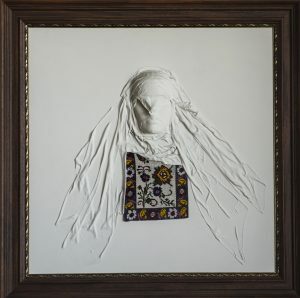 These particular pieces, as shown in the photographs above and below, are a classic example of silent violence which reflect the treatment of Albanian women, specifically brides, during the era of Kanuni (code of customary rules dating back to the 15th century or before, editor’s note). Kanuni is a set of written laws that were heavily practiced especially in rural areas of Albania and Kosovo. Can you tell us what these pieces mean to you? I have been inspired mostly from the Kanuni, which a number of articles refer to the rights of women, specifically during a marriage. 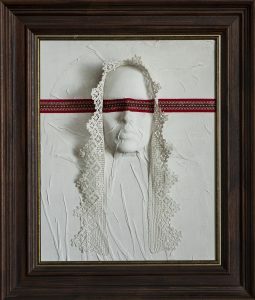 The women displayed in my art pieces are brides, and through these brides, I have tried to express the situation of these women living in a patriarchal society, which for me represent someone who does not have an identity. I have referred a lot to the Kanuni as it specifically has articles which indicate that women have absolutely no rights. She has to obey to the family, serve them, and is not allowed to express her own opinion. In addition, she has no right to form any decisions, neither regarding her home or her children. This was sufficient enough for me to transfer it through art. This is why I have closed their eyes in different ways, to show that something is wrong with them as beings. g) Not to interfere in the betrothals of her sons and daughters. Do you think such patriarchal practices are still present in Kosovo today? Yes, but in different forms. Today women are more educated and more independent, however, there are still cases, especially in rural areas where men dominate in the family. Maybe not as severe as before but it is still evident. Also, I don’t think this only happens in Kosovo as patriarchal families and oppressed women still exist in all societies. In my artwork you can see that the face of the woman remains the same. What I have tried to portray is that this problem is evident throughout many cultures but I have tailored it with traditional Albanian clothes as I am living in that society. As an artist, we have an obligation to reflect these manifestations. What message do you hope the public will gain from viewing these pieces? My main objective is to touch the individuals that still maintain a patriarchal view in society, and for me, it is enough to raise awareness to those people. Do you think art has the power to bring social change? Art has the power to cater information, and it can also bring change to those that are open minded, however through my artwork I doubt that I can change the opinion of men that are patriarchal. For example, just because he is patriarchal, he will oppose me and will not accept my idea. Nonetheless, art as information is a very powerful and an important tool. We are very aware that through art we intake information about different events in the world. For example, during the Rwandan genocide, I was completely uninformed, I only knew that there was a conflict going on. However, when I saw the movie “Hotel Rwanda” that is where I really understood what was going on. So, through an art project, we were given the opportunity to understand the story as it was, and that is more powerful than politics. What message would you like to send to other women and girls? To encourage young girls to become educated as much as possible and to have a purpose for their own lives. They need to be firmer about their ambitions and not wait for society to do it for them but learn to take their own lead. That is how society changes through education.